Well, the types of meetings I must go to these days, I can’t be seen to be taking knitting/crafts, alas. Some people (not my immediate coworkers, I will hasten to add) have decided that it does not look like I’m paying attention, despite the fact that I’ve told them time and again (and again, and again) that needlecrafts help to focus my attention in meetings. This, people, is one of the most brilliant tools I’ve seen for getting through two and three hour meetings and looking like you are actually doing work. Meanwhile, you are reading jokes, doodling with suggestions and generally having fun. My genius partner JJ bought me this at the airport when leaving for London in December, saying “This wuid be a grrrreat thing for all those meetins ye have to go tae, right?”. His less genius partner agreed, and even took it back to the office in January – only to lose it in a pile of paperwork until quite recently. But recently, it emerged, and has provided great hilarity. (Now, I really must confess… I wanted to bring my copy of Wreck This Journal to the ubiquitous meetings. Anyway, if you need something to pass the time during work meetings and you can’t knit/crochet/otherwise craft/scheme there, pick up a copy of the Procrastinator Doodle Pad. You won’t regret it, I promise. Just because you’re diddling with an electronic device under the table, people still know what you’re doing – you are checking your Email, talking with your girl/boyfriend, wife/husband, etc. Don’t pretend you’re actually doing work. If you were actually doing work, you wouldn’t be in this meeting. And, by the way, there is no way you are so important that the person who sent you that urgent E-mail can’t wait another hour for a response. (The following will only apply for those who are over 31 years of age. Please correct me if I’m wrong about this, by the way. I’m turning 38 shortly and for some reason this is bothering me.) Surely you are old enough to remember the days where there wasn’t even any voicemail and people had to take down messages on paper slips. Forget about the computer age. Just give yourself some time to focus and relax and hark back to a time where others didn’t expect an immediate response the minute they pressed “send” on their message. Meditate upon a time that there was no “send” button at all. 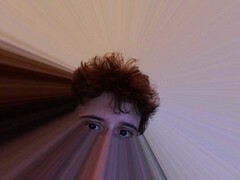 I do realise that the above message was rather hypocritical given that I am communicating it to you on… a blog! However, relative luddite that I am, I still believe that we should use technology rather than technology using us. I’m also a firm proponent of the idea that, when killing time in boring meetings, it should be kept non-tech. So, pick up a pen and paper instead and doodle. And, just in case you thought you were saving the environment by not doodling… it’s possible, for example, to doodle on newspaper. Why, you may ask, will I not just ban meetings altogether when I become dictator? Well, I’ve thought about it… and the fact is that I believe as humans, we need to meet. And talk. And be bored. It’s part of the human condition and partly, I’m sure, what has led you to this blog. Wishing you all a great Friday and weekend. And, to those who may have other reasons to celebrate this particular weekend, happy Pride! Oh, and a PS – I do hope Spain wins the Eurocup. The Greeks and Turks having been eliminated, this is the last dark and swarthy team I can cheer for (I would say “root for” but my Australian friends would snigger and tee-hee, and JJ would then get upset). Newspaper doodling is the best! I do it every Sunday when I attempt to do the crossword puzzle and realize that I can only fill in a couple of blanks but can’t totally give up. Also it helps to pass the time while Joe watches Meet The Press. Tim Russert RIP. I want to be part of your Nietzschean dictatorship! Can I be your sub-lieutenant, please? I went away for a few days recently and forgot to take my mobile, and I almost got off my train to go 30 miles back home for it. I keep thinking, how did I cope without all this junk? I’m with you with the Spanish! Go Fabregas! You know I love knitting as much as the next knitting obsessed blogger – but there is no way I’d let people knit during work meetings. I don’t let them do woodworking, stone carving, macrame, needlepoint or painting either. Hobbies are generally not allowed in my meetings unless the meeting is actually about the hobby (which I confess only happens once a year in December when I hold a paper snowflake making meeting). Other than that, meetings are to share information, come to a decision or bore you into a coma. Most seem to be of the third variety, but heh ho – that’s what they pay us for! I’m still all for you as dictator though! When your dictatorship comes in to effect I’ll join in the meeting knitting if it’s a knitting meeting. Otherwise, I’ll do what I do now, claim I have a scheduling conflict, decline the meeting and then slope off to Starbucks to knit in peace! One of the very best things about getting older and retiring is that………THERE ARE NO MORE MEETINGS! That’s what I like about working at home, by myself. I can have meetings whenever I want. I can talk about anything I want to talk about. I can knit, chew gum, read, fold laundry, or show up in my pajamas if I want to. This is quite a life I’ve carved out for myself. Certainly there will be many, many knitting/general crafting meetings in Brouhahaland… as well as many, many beverages of one’s choice. 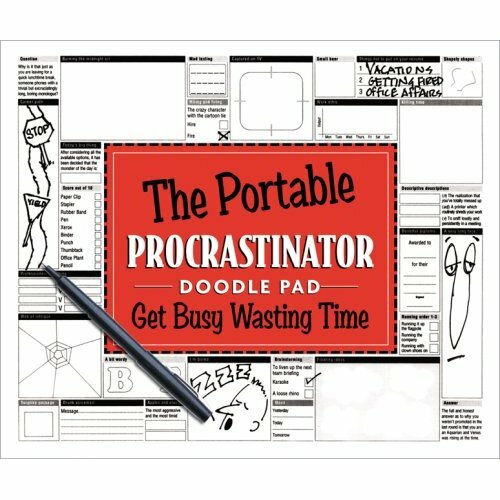 I loove that portable procrastintor! I think I need one for the Ogre. 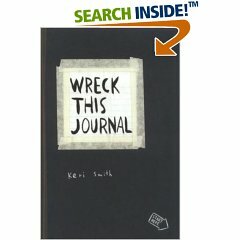 My Wreck this Journal? I am lovingly numbering the pages…while I go to the bathroom. Amy and Sequana – if there are words to describe the pangs of envy I got when I read your posts I don’t know what they are. It was sort of like I was invited to momentarily glimpse heaven — and then cruelly dragged away. Sigh. Off to my last meeting of the week. Only the promise of the weekend and a future in Brouhahaland will get me through it! I know this is a slightly touchy subject, but I’m with you, Soo, on the ‘knitting in meetings’ thing (but do you think The High Priestess Brouhaha will now ban us from her blog?). Not that I go to any meetings anymore (I’m with Sequana on that front, thank the lord). But if I did go, then I would ban all hobbyists. Although the Procastinator would be fine. I’ve been knitting at big meetings, away from my little corner of the district. Nobody has had the nerve to question it yet. I make a show of actively taking notes and looking at the person speaking. I also put it away when we have to do the dreaded breaking into smaller groups or if we have a guest speaker. (Note: I said “when”, not “if”. Oh, pity me!!) The knitting helps me keep my mouth shut and not get my little corner of the district in trouble.